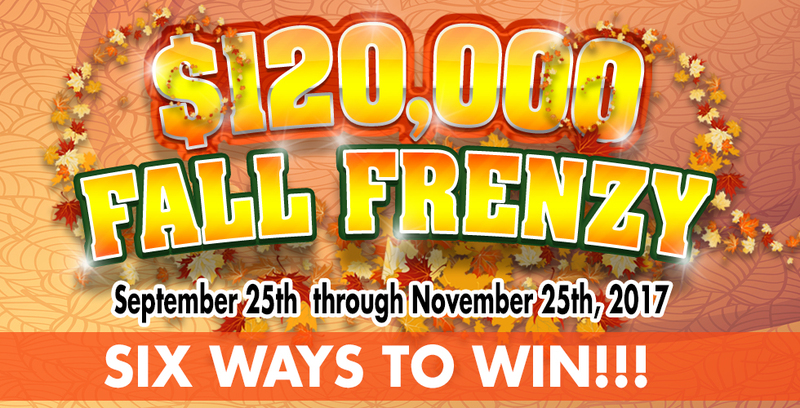 The Sands $120,000 Fall Frenzy is blowing in and is filled with Fall FUN! Play The Fall Frenzy Kiosk Game Monday through Wednesdays September 25th to November 25th, 2017. Win Great prizes and a chance to win the Gold Leaf or Red Leaf PROGRESSIVE JACKPOTS! Play each Thursday and Friday for a chance to take away $150 E-CASH! Top 10 Scores will win between $25 and $150 in E-CASH each day. Saturdays at 6PM and 8PM be one of 5 lucky winners at each drawing to win between $75 E-CASH and $1,000 CASH! Each hour 1 Lucky winner will win $100 in E-CASH just for using their Sands Player’s Club card while playing slots!